View More In Spectrophotometer & Colorimeter Accessories. Microporous Film is a gas permeable membrane that enables the analysis of non-volatile liquid and powdered sample substances in helium flushes or vacuum. Pressure differentials within the sample cup and sample chamber are equalized while maintaining a taut thin-film sample support plane. The Series 1500 XRF Sample Cups are designed for use with Microporous Film. One of two supplied Snap-On Rings included with the 1500 Series Sample Cups is used to attach Microporous Film to the Cell neck of the open end of the sample cup nearest the outer integrated flange. The sample cup Cell is designed with the unique "bead-to-indent" geometry that creates taut thin-film sample support planes and effective seals against leakage. The second included Snap-On Ring is used to affix a thin-film sample support window to the opposite open end of the sample cup. In practice, the illustrated assembly procedure is reversed. The thin-film sample support is attached first enabling one or more sample cups to be conveniently filled from the top end; Microporous Film is attached last. 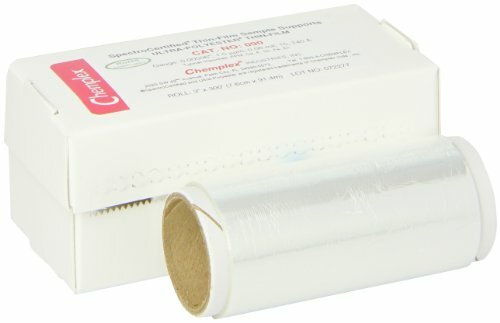 Microporous Film is also available in Easy-to-Use Precut Circles for elimination of trimming and convenience of attachment to Chemplex XRF Sample Cups. If you have any questions about this product by Chemplex, contact us by completing and submitting the form below. If you are looking for a specif part number, please include it with your message.